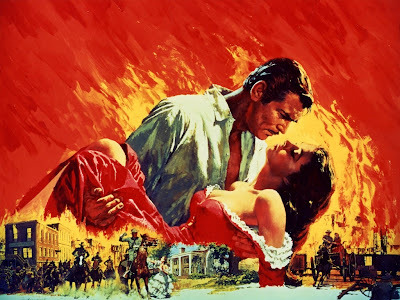 Next month marks the 75th anniversary of the publication of Margaret Mitchell’s Gone with the Wind, and 150 years ago last month, the first shots of the American Civil War were fired. Here in Atlanta, now a mecca for many African-Americans well-versed in the rich history of the city’s civil rights movement, one can still find dubious organizations, like the Sons of Confederate Veterans, that refer to the Civil War as the War of Northern Aggression. In fact, living in present-day Atlanta is a curiously dichotomous affair. The past and the present are constantly juxtaposed in the strangest of ways. Take our midtown, a thriving collection of gleaming, new buildings reaching into the sky and surrounding landmarks like the iconic Varsity restaurant (the largest drive-in joint in the world), Peachtree Street’s Fox Theatre (once – and sometimes, again – a luxurious movie palace), or the Margaret Mitchell House, the place where the author wrote a large portion of Gone with the Wind until moving out in 1932. The Margaret Mitchell House itself is emblematic of Atlanta’s and, indeed, the South’s tendency to rehabilitate its image in light of its dubious history before the civil rights era. Mitchell and her second husband, John Marsh, never actually had the run of the entire house, affectionately nicknamed “the Dump” by the novelist. In 1925, when the building was a 10-unit dwelling known as the Crescent Apartments, Peggy Mitchell (as she was known to her fellow journalists at the Atlanta Journal) and Marsh moved into Apartment 1 on the ground floor. Last week, I took a tour of the small flat. I was shocked by its size, so tiny that the radiator is bolted to the living room ceiling. Much of the furniture in the apartment, though not actually Mitchell’s, is of the period. And many of the objects that occupy the rest of the museum are replicas, looking accurate despite not being the true antique objects of value. From what I remember, I would not even rate Gone with the Wind a perfect score. I personally prefer Casablanca. But, nice post, this was a great film.